I'm not a big fan of pie, but I do like chocolate pudding pie. Not to mention it's the easiest kind of pie to make. 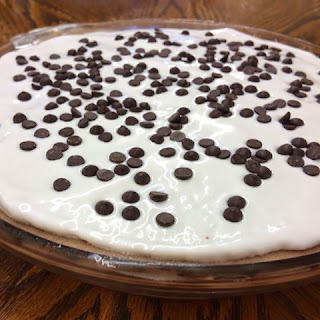 In years past I would buy a pre-made graham cracker crust and make instant pudding mixed with Cool Whip for a little piece of heaven in my mouth. Unfortunately, that won't work for my little ones with food allergies. 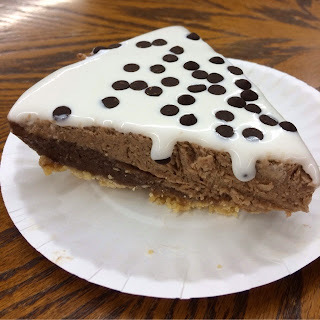 Last year I made a chocolate cream pie, but it didn't go over as well as I had hoped. But thanks to a little help from my SIL at Making it Milk Free, Enjoy Life Foods, and So Delicious I was able to successfully recreate my favorite pie recipe. Combine crushed cookies and melted butter and press into pie dish. Bake at 350º for 8-10 minutes. Allow to completely cool before adding pudding. Click here for the full recipe. I used rice milk instead of almond milk. My pudding turned out a bit runny, but perhaps I should have cooked it a bit longer. Also, using almond or coconut milk may help make it thicker. I made a double batch of pudding for this pie. Once it is thickened, cool at room temperature for about 20-30 minutes before refrigerating. Let completely cool in refrigerator, about 4 hours or overnight. Spoon half of the pudding mixture into the pie crust. Mix other half of pudding with half a container of So Delicious CocoWhip. Spoon on top of pie. Refrigerate for at least an hour before serving. 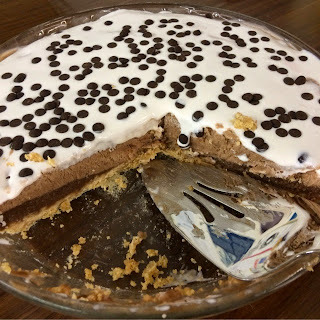 Just prior to serving, top with remaining CocoWhip and Enjoy Life chocolate chips. Enjoy! I hope this turned out well for you. We all enjoyed it!